After downloading the MySpeed for Mac disk image file (dmg), this image file will appear as a new drive on your desktop. Open this drive and double click the Package file inside to launch the MySpeed installer. Follow the steps on the remaining screens and agree to the End User License Agreement to complete the install. After installing MySpeed for Mac, you MUST restart your browsers. 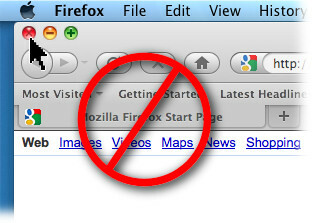 To restart your browser, you need to Quit the application from the Application menu. Clicking the to close the Window does not quit the application. 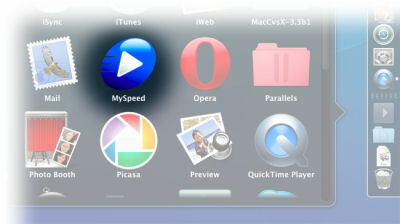 After the installation completes, you will find a MySpeed application icon in the Mac Applications folder. This Applications folder is typically an icon on Mac Desktop Dock. Open the Applications folder and click the MySpeed icon to launch MySpeed. You should see the small gray MySpeed icon at the top right of your screen in the Mac Menu Bar (see images below under Using MySpeed for an example). After MySpeed for Mac is installed, the MySpeed Activation Dialog should be displayed. Click the "Start Trial" button to start your Free 7 Day Trial. 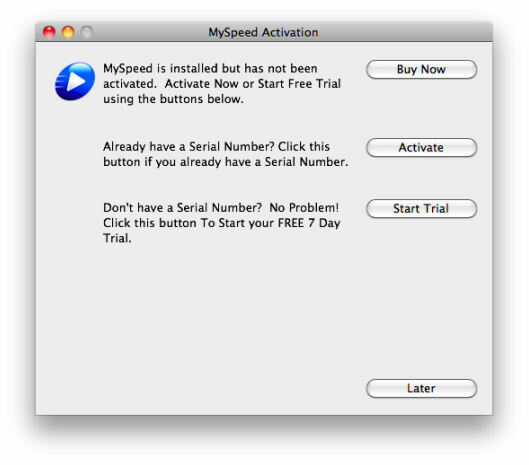 If you are at the end of your Free 7 Day Trial, you will need to purchase a Serial Number to activate MySpeed for Mac in order to continue using the software. If you have your Serial Number, see the MySpeed for Mac Activation Instructions page. 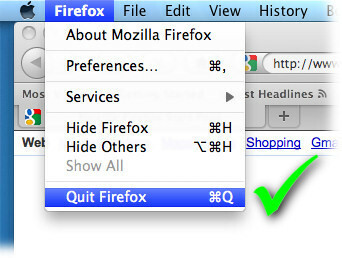 After MySpeed launches, you will notice the MySpeed icon at the top of the screen in the Mac Menu Bar. 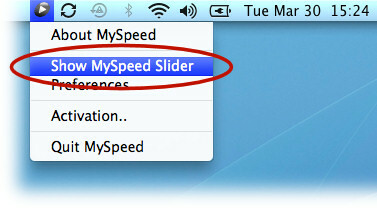 Click on the MySpeed icon in the menu bar to display the MySpeed Menu. From this menu, click Show MySpeed. You should now see the MySpeed Slider on the screen and the title bar will indicate whether Enounce MySpeed is Active or No Flash is playing. Open your browser and navigate to any Flash Video website (such as YouTube) and start to play the Flash video. The MySpeed icon should turn blue and indicate that MySpeed is active. This is a great piece of software. Easy to use. Great productivity tool. I am able to speed up videos and make more efficient use of my time studying for my classes.